This time, Sew Tara is giving away one of her super cool, super cute, cup cozies! (You may remember her "Caffeinating...Please Wait" cozy. The poor dear is just catching up after a rush of orders on that!) Recently, Tara started using screen printing along with the embroidery, and I think it's genius! 1. Visit Tara's shop and blog, then come back and tell us what your favorite thing was that you saw. 2. Follow Sew Tara's blog for an extra entry (leave a separate comment). The giveaway will be open through Thursday night at Midnight CST, and I'll announce the random winner on Friday. I just blogged about how I wanted to try and make one of these the other day! If I can win one it would be even better! I really like the caffeinating... please wait cup cozy but it was a hard choice, they're all so cute. Hands down my favorite item in her shop is the matching set of Mr. and Mrs. cup cozies! Amazing! I love the "do stuff/procrastinate" one! I DO love the "caffeinating..please wait". I can think of so many people to gift that to. And, I totally dig the Kool Aid beach bag....upcycled and adorable! Oh man I so love love the tea bag cozy! And her post about trying to have a photoshoot! Oh yes yes, it is so like that! Oooh, I love it all but my favorite has to be the "her cup cozy." SO cute!!! Ok having seen her creations in person, I MUST win this. I *heart* the do stuff, procrastinate cozy. I'm following her, technically. I'm subscribed in my feed reader because Follow doesn't seem to work properly for me. But if it's not worth an extra entry, no problem. i really love her ultimate beach bag out of the koolaid jammers pouches. And of course all the coffee cozies! I am a follower of her blog! Cute product! My fave is "I heart T". My fav is the do stuff/procrastinate sleeve. Super cute and true! I'm a blog follower, of course: we share the same name and I LOVE her stuff! my fave is the i <3 t cozy! how adorable! & a follower of her blog! Thanks for sharing the cute find! so cute! i've tried to crochet a couple cozies and they're always the wrong size. or they stretch or something. it's just not right. Love the "caffeinating..please wait" cozy. hands down, "caffeinating, please wait" is the best. the spelling bee champion is a close second. it's dear to my english teacher heart (err, i don't always practice what i preach as you can see). also, in her blog goes into my Google Reader. she'll go into my "craftiness" folder. she'll be in good company with you. I love the "I feel so warm and cozy" one the best! I love the sleeve that says "please wait...I'm caffienating." fab! both sew tara and wild olive are on My Yahoo! 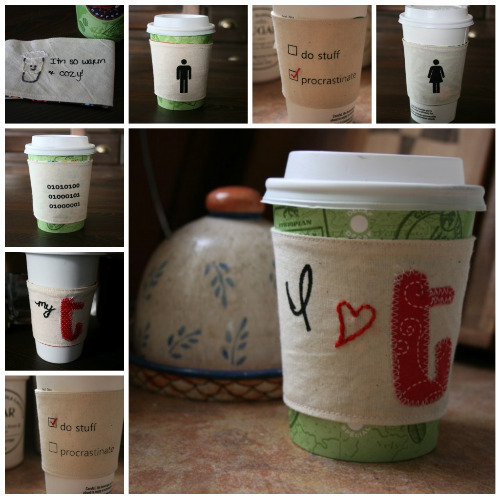 Love the "Caffeinating..please wait" and the reversable one cozies! They are all too cute! The Tea Bag/Sweetener cozy is adorable! I like the Tea Bag Cozy! put it on facebook, tweet tweet. Following her blog. Loved the pumpkin family, wish i had a porch to copy it with. Love the Canadian passport holder(s)! I love the "I'm So Warm and Cozy" cozy! It's so cute. I am following Sew Tara's blog!!! I love the geek coffee cozy! The binary is just awesome.